There are so many activities to choose from when visiting Costa Rica so how do you know which one is right for you? On a horseback riding tour, you’ll get the same benefits as every other tour in regards to enjoying the views, seeing the abundant wildlife and learning about the various exotic plantations, but your horse does all the hiking for you. If you like horses, you’ll love our Arenal Horseback Riding tour options. 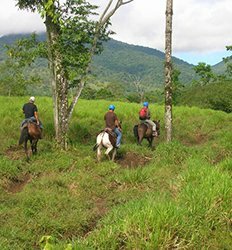 The Northern Arenal Volcano region is by far one of the best places to horseback ride. With rivers, scenic valleys and magnificent waterfalls, you can’t beat the cowboy feel as you ride through this gorgeous country. 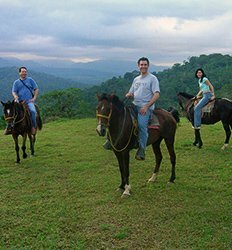 If you are a horseback riding enthusiast or just looking for a great family activity, take a look at what Arenal Horseback Riding tours The Real Deal Tours has to offer! 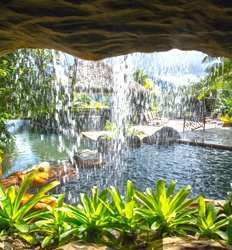 Nestled in the heart of Costa Rica's majestic northern volcano region is a beautiful 50-acre private estate in Arenal that offers a spectacular view of the Tempisque River and the Gulf of Nicoya. 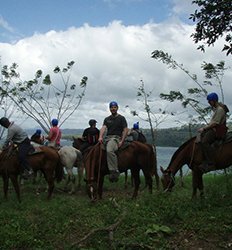 Our Arenal Volcano Horseback Riding at the Los Lagos Resort is the perfect eco tour in Costa Rica for nature lovers and equine enthusiasts alike! For hundreds of years, the local inhabitants of the Arenal Volcano National Park have used horses as their primary mode of transportation through the jungle forests. Now you can experience the park like they do, on our Horseback Riding to La Fortuna Waterfall tour! We will trot through pastures, dense forest and tall hills. 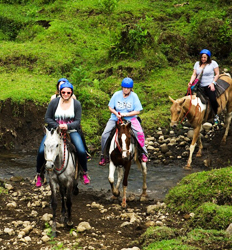 Horseback Ride to La Fortuna Waterfalls deposit is $19.00 per person. Looking for more than just a horseback riding tour? Club Rio at The Springs Resort lets you combine 2 activities such as inflatable kayaks or tubing the Arenal River a nature hike or a climbing and rappel wall along with your horseback riding adventure. Strong, healthy, well-behaved horses are our companions as we meander through the jungle lowlands of La Fortuna. It’s an easy ride and a perfect complement to the other activities in store for us such as hiking La Fortuna and rafting Balsa River’s class II/III rapids. A trifecta of fun! Balsa River Paddle, Arenal Saddle & La Fortuna Waterfall Hike Tour deposit is $25.00 per person.